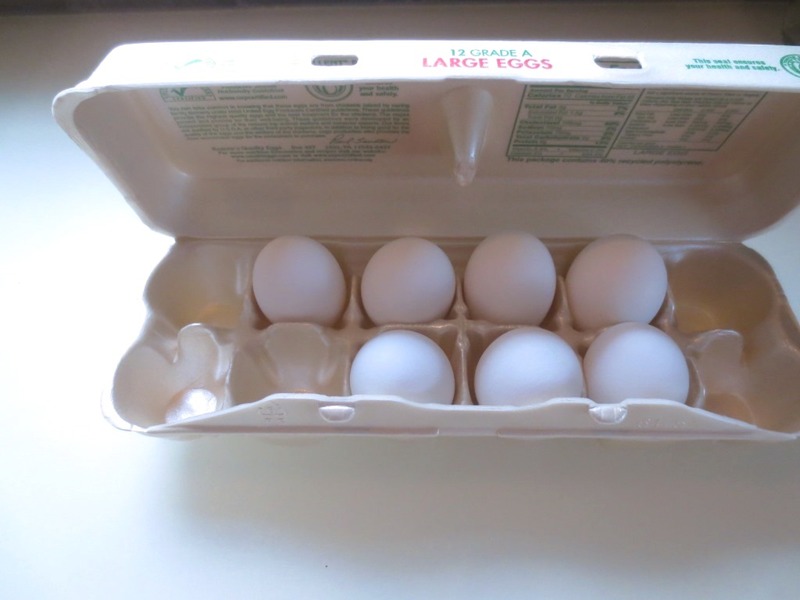 I showed you here how I blew my eggs. The year of the Blue egg. Now I have another egg project that doesn’t involve blowing, instead bluing. 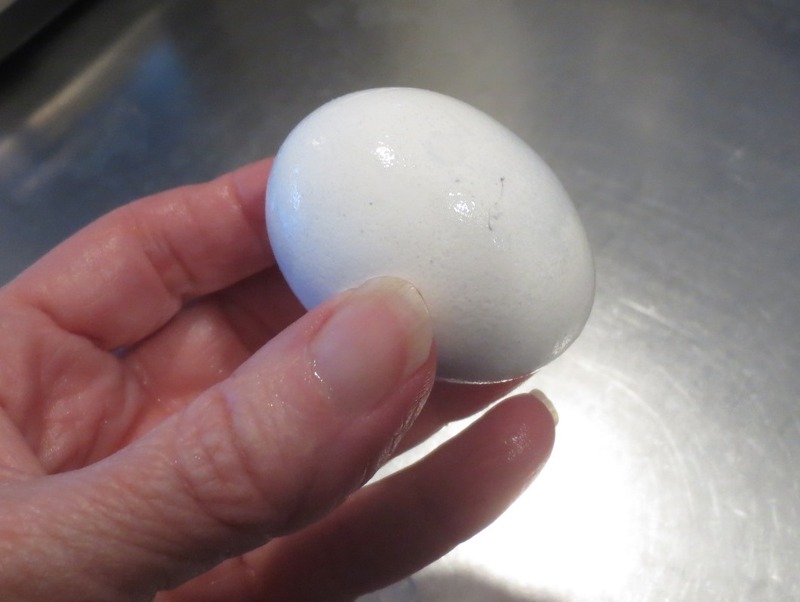 I hard-boil eggs by the steam method: set eggs in 1/2 inch of water, simmer for 6 minutes, then off the heat (without opening the lid) for another 6 minutes. 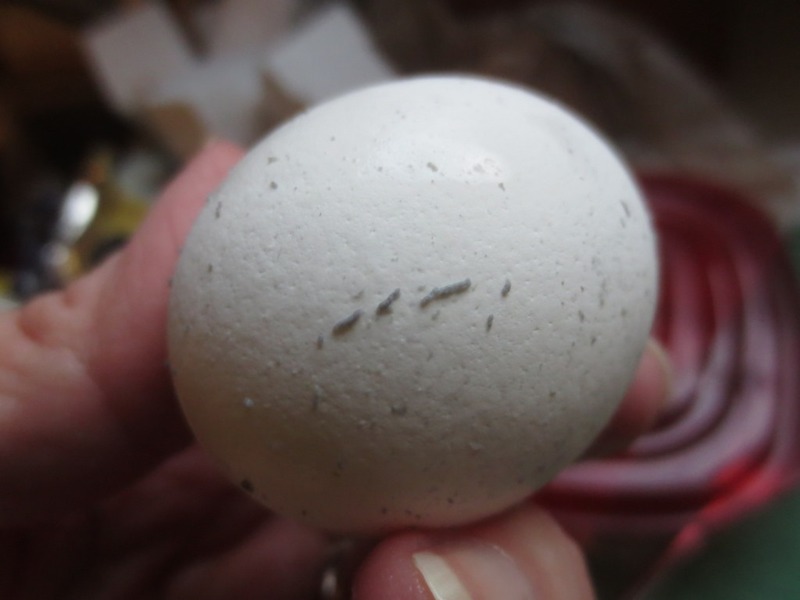 These eggs start by being hard-boiled with the steam method. The goal is blue eggs from red/purple cabbage. 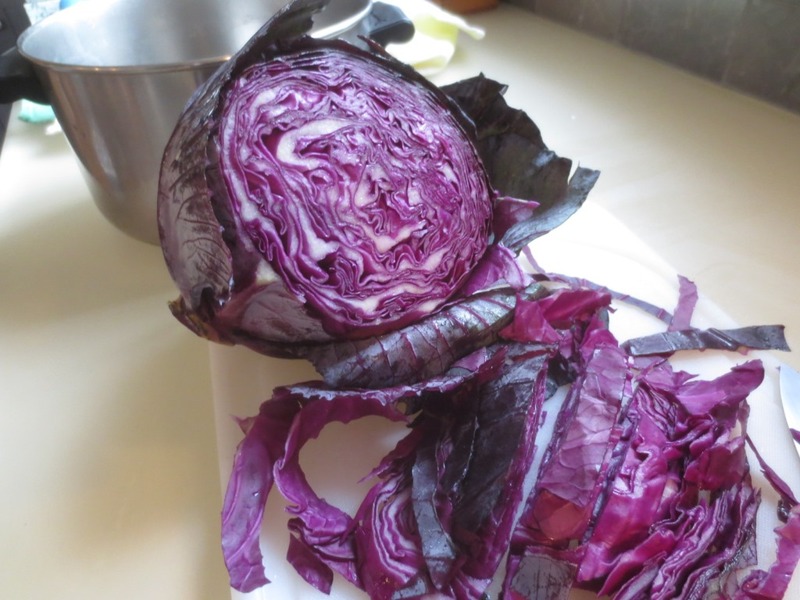 At the same time I cut up a head of red/purple cabbage and covered it with water. The cabbage water turns a brilliant magenta almost immediately. Let this simmer for at least half an hour. 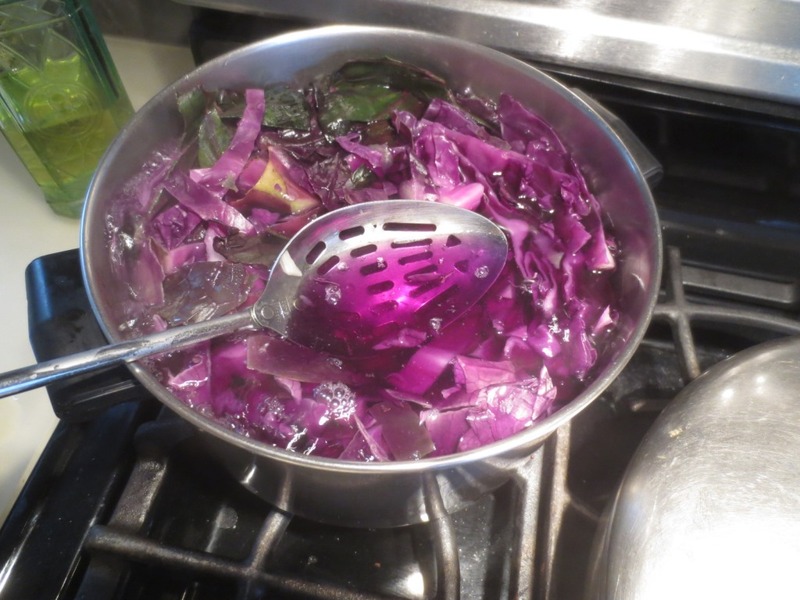 When the all the color has been extracted from the cabbage, strain it. White vinegar and salt help to set the dye (I think). 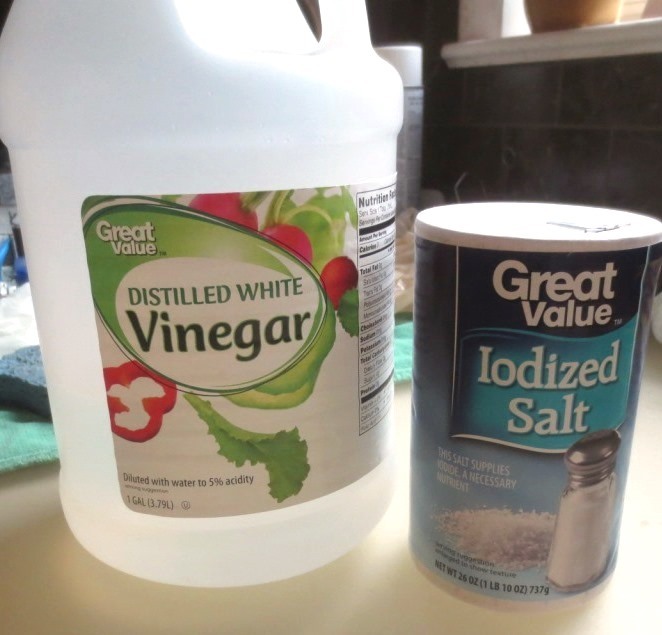 Add 1/4 cup white vinegar and 1/4 cup salt to the dye. 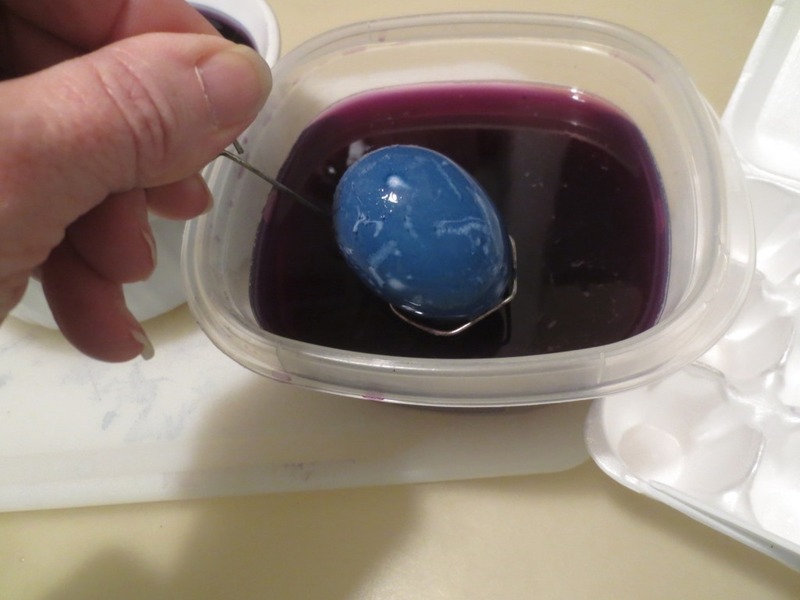 Lower the eggs gently into the dye. 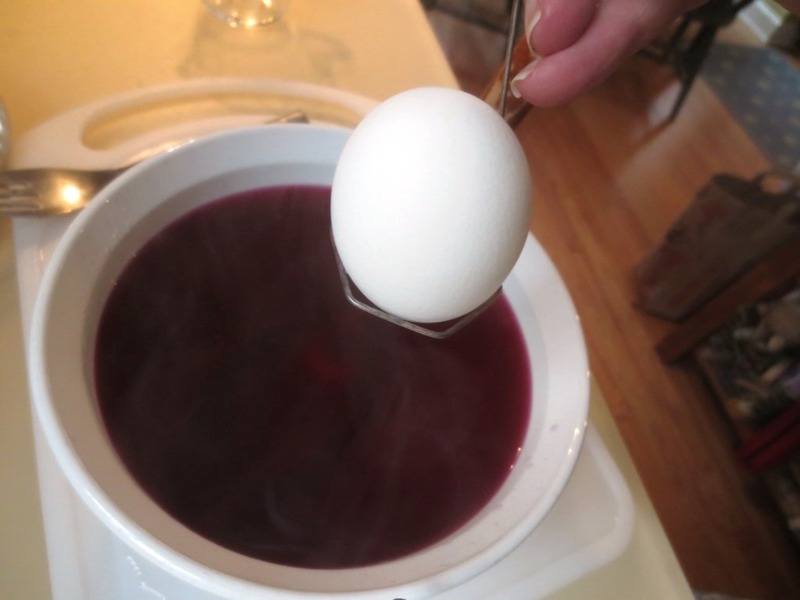 Carefully submerge the hard-boiled eggs. 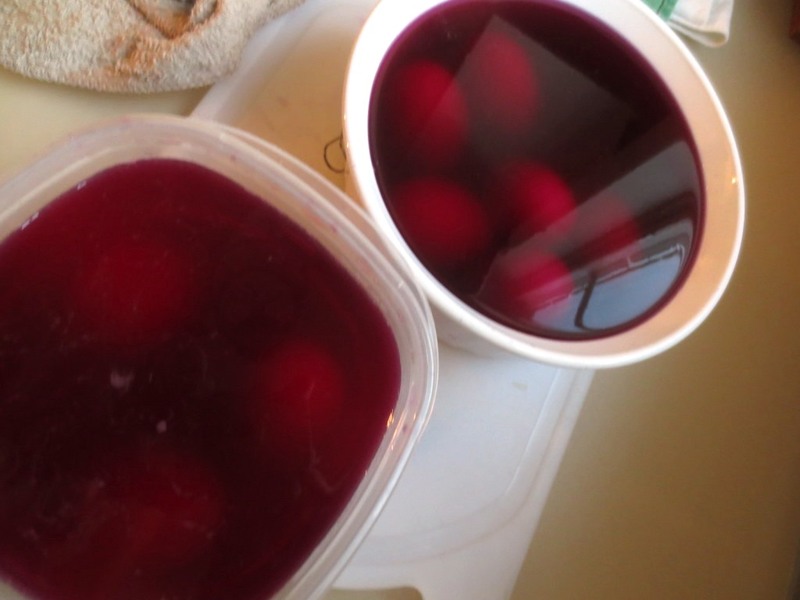 After a few minutes in the dye bath the eggs did not seem to be taking on any color. The eggs didn’t seem to be coloring at all so I took each one out and rubbed it with a clean make-up sponge soaked in white vinegar. Rubbing the eggs with white vinegar produced dirty debris which I washed off the eggs. This step seemed to remove a layer of gunk that may not have allowed the dye to soak in properly. 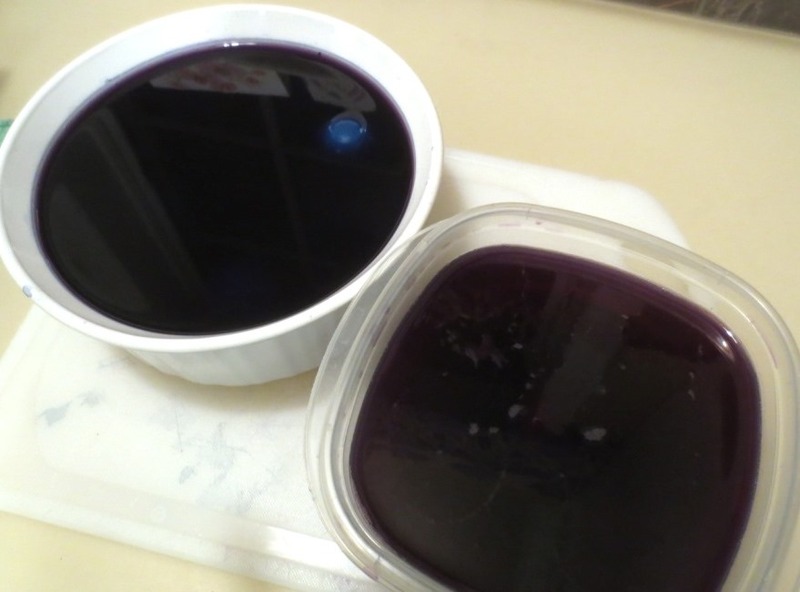 The dying solution was a deep magenta when the eggs were dropped in. Twelve hours later the solution had turned almost black. I reimmersed them and let sit overnight for the deepest color. 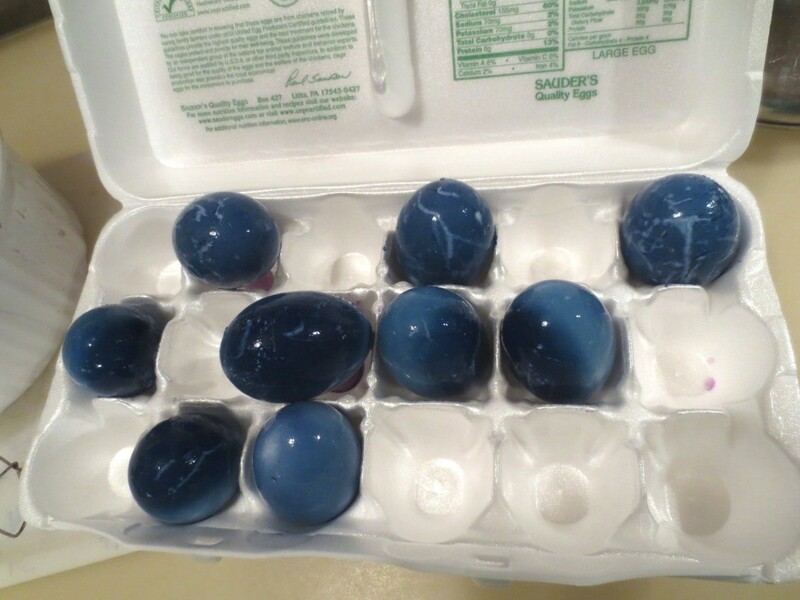 The white eggs which hadn’t colored at all the night before turned magically blue. 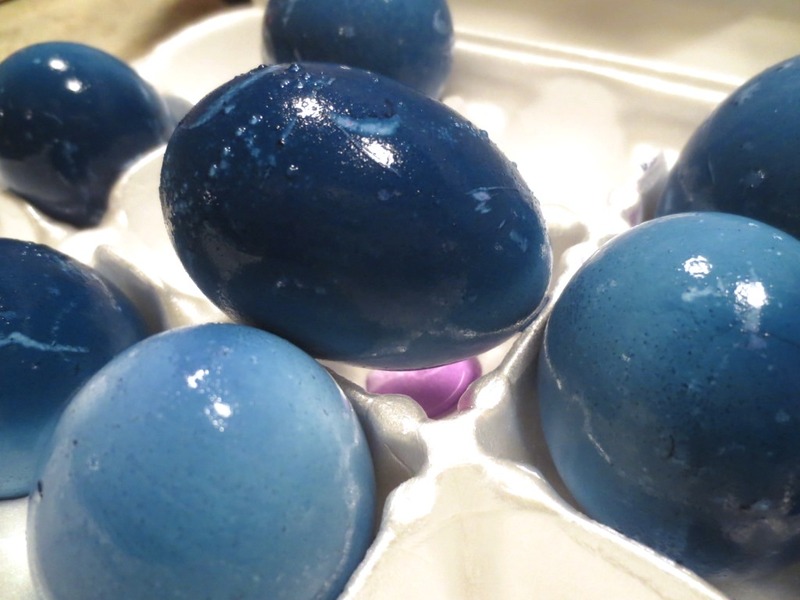 I was delighted in the morning to find the eggs had been dyed a deep and variegated denim blue. I set the wet eggs in an egg carton to dry. We won’t eat these although they were made in a totally natural way. I’ll keep them refrigerated until next week when they go on display. Update: When I took the eggs out of the refrigerator 4 days later they had turned turquoise. Do you have special plans for Saint Patrick’s Day? 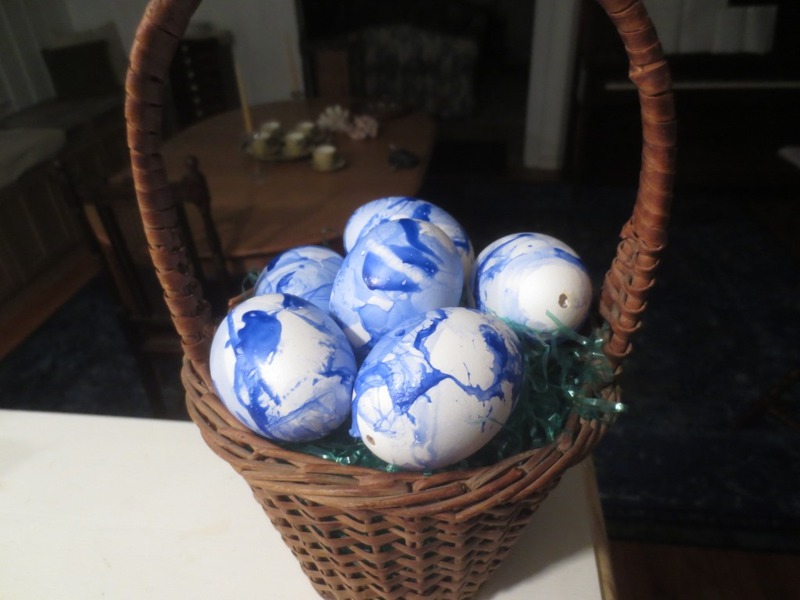 These came out beautifully and will be a great addition to your blue egg theme! Please come make my eggs for my nine year old! These are beautiful. I’ve heard of using purple cabbage but didn’t know it would produce blue. Those are beautiful blue eggs!!! Let's Face the Music Blog at WordPress.com.